In the nearby image, the two sites called “Home” were both created when a Microsoft Team was created. 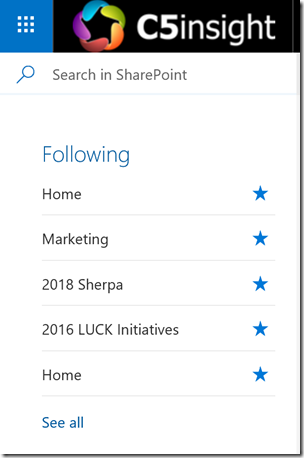 The other sites are “classic” SharePoint sites. This isn’t a very helpful label when trying to quickly use the Following list to quickly navigate to favorite SharePoint sites. The funny thing is that those same site names look just fine when you view them in the “Recent” list of sites. The good news is that we have made Microsoft aware of this issue and are working on a fix. We’ll update this blog (or post another) as soon as we have a fix. In the short-term, train your users to look at their Recent sites. Or, on some browsers, users can hover over a “Following” link and see the URL nearby. Rename the site home page in the left-hand navigation. This has no effect on the name in the list of sites you’re “Following”. Edit the Title in the list of Site Pages. Same as above: no impact on the list of “Following” sites. Edit the Name of the home page in the list of Site Pages (i.e. change “Home.aspx” to “Marketing.aspx”. - Please do not attempt this – it breaks the link to the home page for the site and you might have trouble navigating back to the page to set it back to its original name. Want to get notified when a solution to this problem is posted? Click here to subscribe to the C5 Insight blog.